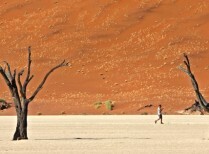 Journey through epic landscapes on a Namibia tour with Springbok Atlas. Our widespread guided adventure takes in all Namibia’s highlights from the red deserts of the south to the foggy Atlantic shore; from the rugged northern beauty of Damaraland to the magnificent wildlife in Etosha National Park. Our Namibia holiday packages will give you the opportunity to explore the Kalahari and Namib Deserts, the spectacular Fish River Canyon and the popular seaside town of Swakopmund. This excellent Namibia tour also takes in the highlights of northern Namibia including the World Heritage Site, Twyfelfontein, and the world-renowned Etosha National Park. 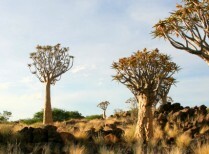 Chat to us today about our Classic Namibia tour. Depart Windhoek and drive via Rehoboth into the Kalahari Desert for overnight. Day at leisure to explore Swakopmund (unguided). Relax in a lush green oasis in the midst of vibrant red Kalahari sand dunes. 20 kilometres before the main viewpoint of the Fish River Canyon, you’ll find the Cañon Roadhouse, a characterful, comfortable and caring establishment with a charming cult-car theme. Situated in the spectacular Aus Mountains on the private Klein Aus Nature Reserve, this lodge offers comfortable, safari-style accommodation, caring service and great dining, as well as stunning southern Namibia vistas you will never forget. Halfway between the Namibian Desert seaside towns of Lüderitz and Swakopmund, the Hammerstein Lodge & Rest Camp nestles between the scenic Nubib and Tsaris Mountains. Set in a stunning 25 000 hectare private nature reserve bordering the world-renowned Namib Naukluft Park, this lodge offer s a great desert experience that is unique, peaceful and nature-loving. Situated just 200 metres from Swakopmund’s main beach, this guesthouse offers stylish en suite rooms with all modern conveniences and a private patio overlooking a peaceful, lush garden. Set in the picturesque, ancient Huab valley, this natural stone and thatch lodge sensitively blends in with the stunning mountains and plains. This luxury safari lodge is just 2 kilometres from the Eastern entrance of Etosha National Park and is set in its own adjoining private reserve. Relax in a lush green oasis in the midst of vibrant red Kalahari sand dunes. Begin the day with a hearty buffet-style breakfast and then relax in the shaded courtyard and take a dip in the swimming pool. Alternatively, while away the time in the restaurant or bar, spend it watching vultures and marabou storks, or explore the Kalahari on foot by following one of the hiking trails. 20 kilometres before the main viewpoint of the Fish River Canyon, you’ll find the Cañon Roadhouse, a characterful, comfortable and caring establishment with a charming cult-car theme. The individually-decorated en-suite rooms are gathered around an inner courtyard, creating an ambiance of tranquil homeliness. The theme à la carte restaurant and bar are innovatively decorated with old car parts found in the area, and this unusual creativity seems to inspire a fantastic atmosphere for the sharing and telling of traveller’s yarns. A large terrace accommodates summer-night dining under a dazzling array of stars. The large swimming pool and sun deck surrounded by indigenous succulent gardens offers welcome relaxation and respite from the desert heat. Situated in the spectacular Aus Mountains on the private Klein Aus Nature Reserve, this lodge offers comfortable, safari-style accommodation, caring service and great dining, as well as stunning southern Namibia vistas you will never forget. Relax with a sundowner on the wooden deck and watch the extraordinary changing colours of a Namibian sunset, before enjoying an excellent dinner in the restaurant and perhaps a night-cap in the bar or lounge. The rooms are spacious with private bathrooms, exceptional views, ceiling fans, mosquito nets and other modern conveniences. The legendary wild horses of Namibia are regularly sighted in the vicinity. Halfway between the Namib Desert seaside towns of Lüderitz and Swakopmund, the Hammerstein Lodge & Rest Camp nestles between the scenic Nubib and Tsaris Mountains. Accommodation is in comfortable en suite rooms and the lodge offers dining, a bar and relaxation around a sparkling swimming pool. Set in a stunning 25 000 hectare private nature reserve bordering the world-renowned Namib Naukluft Park, this lodge offers a great desert experience that is unique, peaceful and nature-loving. Tucked against the impressive granite hills, every room offers spectacular views across the open desert plains. All rooms are en suite, with air conditioning, private verandas and fridges. Traditional meals are served on the scenic veranda or in the open-air lapa. Guests can relax in the local African craft-inspired lounge or the friendly bar, or cool off in the sparkling swimming pool. Situated just 200 metres from Swakopmund’s main beach, this guesthouse offers stylish en suite rooms with all modern conveniences and a private patio overlooking a peaceful, lush garden. Excellent restaurants, a heated swimming pool and many places of interest in the town are within easy walking distance. Set in the picturesque, ancient Huab valley, this natural stone and thatch lodge sensitively blends in with the stunning mountains and plains. The surrounding Twyfelfontein Uibasen Conservancy, a UNESCO World Heritage Site holds a wealth of Khoikoi rock engravings and paintings. Accommodation is in comfortable en suite rooms, and there is a lounge, open dining room and friendly bar. Guests can relax around the sparkling swimming pool. Etosha Safari Camp is conveniently situated just 10 kilometres from world-renowned Etosha National Park. Perched on a small hill, each uniquely designed en-suite safari-bungalow promises comfort at all times. Beds are covered with spacious mosquito nets and the gauzed windows provide optimal air circulation. Meals are served in a rustic farm style restaurant at the foot of the hill and here you can also refresh yourself in the swimming pool, make use of the internet cafe or enjoy one of the walking trails that surround the camp. This luxury safari lodge is just 2 kilometres from the Eastern entrance of Etosha National Park and is set in its own adjoining private reserve. Accommodation is in spacious rooms with African-inspired décor, en suite facilities, a sitting room, private veranda and modern conveniences. The lodge offers excellent dining experiences in both the restaurant and under the stars in the boma. There are two bars where you can enjoy sundowners or a nightcap. Relax around the sparkling swimming pool or get some exercise on one of the 2 floodlit Tennis courts situated in the bush. The lodge also offers a Fitness Centre and luxury Spa.